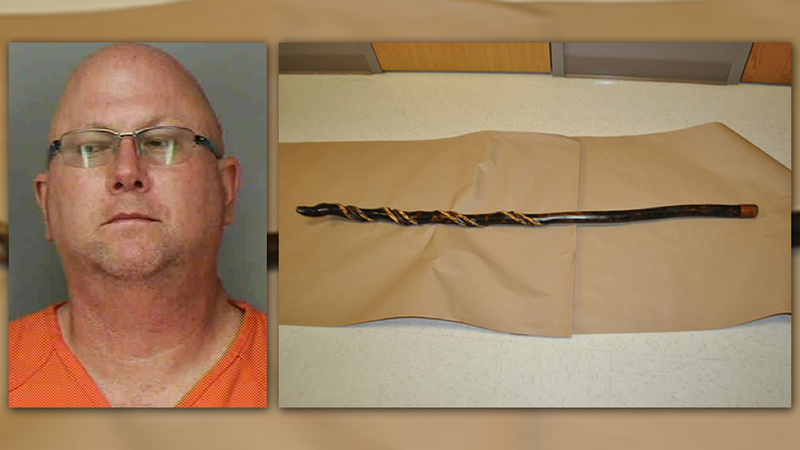 WINTER HAVEN, FL -- Police in Winter Haven have charged a 52-year-old convicted felon with beating a disabled woman with a walking stick he called the "Stupid Stick." Phillip Dale Simons, 52, was taken into custody earlier this week in what police termed "a horrific case of repeated physical abuse." Investigators say they learned of the alleged abuse involving the woman and a disabled minor living in a home with Simons on May 19. In addition to the beatings, Simons allegedly threatened the woman and the 15-year-old with guns. In a news release, Winter Haven police said "Simons would repeatedly go off into a rage for unknown reasons with yelling and physical abuse. Sometimes the abuse would be committed with his bare hands, but mostly with the "Stupid Stick". Simons was booked into the Polk County Jail on charges of aggravated abuse/battery of a disabled adult, aggravated battery with a deadly weapon, 12 counts of possession of a firearm by a convicted felon, three counts of possession of ammunition by convicted felon, aggravated assault with firearm, and child abuse without great bodily harm/aggravated assault with deadly weapon.